As Australia take on England in 5 match ODI series(starts on June 13, 2018). The team for this tour has new bowling squad, which is somewhat similar to the one that they played in South Africa in 2016. Since that tour in 2016 Australia’s bowling looks pedestrian at times. They are going through rough phase with at least 22 regulars bowlers used in last 2 years. The tour of SA was their worst bowling performance in 20 years. One can say it was start of bowling decline. In that series their bowlers conceded 133 boundaries(106 x 4s + 27 x 6s) in first 3 ODIs!!. Overall 195(164 x 4s + 31 x 6s). They went into that series with the most in-experienced bowling attack. The likes of Starc, Hazlewood, Faulkner and Coulter Nile were either injured or rested for that tour. Surprisingly they picked bowlers who had little or no domestic experience and had poor season. The selectors picked bowlers like Joe Mennie and Chris Tremain making their Int. Debut. With Daniel Worrall(2), Adam Zampa(14 ), Scott Boland(11) and John Hastings(24)only playing handful of Int. matches. Since that series they conceded 5.78 per over in 29 games(till Jan 2018). 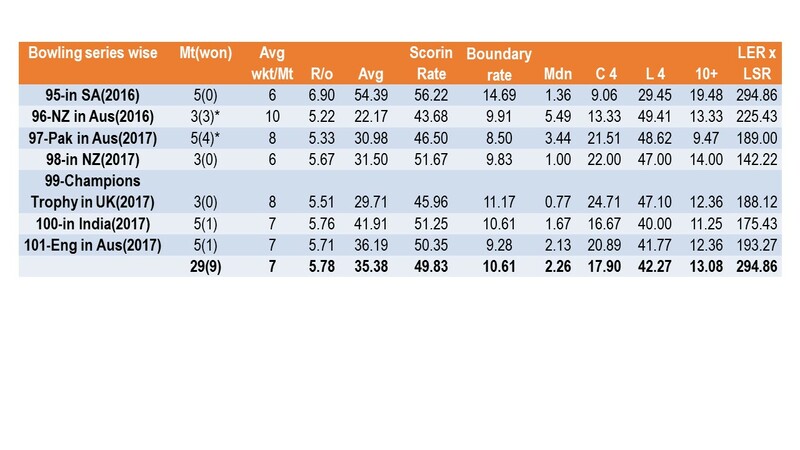 Below stats table is summary analysis of Australia's bowling since the tour of South Africa in 2016. The asterix suggest series won, which is only two... and since then they lost all their series(4) summing up only 2 wins in 16 ODIs!. 2 medium fast bowlers, the experienced Kane Richardson and rookie Michael Neser. 2 spinners, in-experienced Agar(left arm spin) and Test off-spinner, the experienced Nathan Lyon who only played 13 ODIs(last played in August 2016) . These bowlers are backed by batting all-rounders – the likes of Maxwell, Stoinis, and Head who can bowl few overs in mid innings.